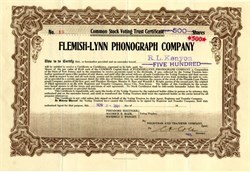 Beautiful certificate from the Flemish-Lynn Phonograph Company issued in 1916. This historic document was printed by J.Meyers Banknote Company and has an ornate border around it. This item has the signatures of the Company's President and Treasurer and is over 91 years old. Flemish Lynn Phonograph Company was located on 37th Street, Brooklyn, New York. UNSCRUPULOUS PROMOTERS Such schemes as this to catch the unwary dollars of investors are common on the Curb. In its defense it is said that the Curb market is an open one, and Curb brokers contend that they are not to blame if outsiders trick the public. But such gross manipulations as Cobalt Central, which paid dividends that were not earned; Micmac Mining, the fraud that drove J. Thomas Reinhardt to London to escape arrest; Gold Hill Consolidated, in which copies of letters on United States Senate stationery were used; Miami Merger Copper, which was "rigged" by Harry Lefkovits from 25 cents � share up to $2.06 and then quickly fell to 62^- cents; Jerome-Prescott Copper, which had as sudden a drop from �9.00 to 25 cents a share when the bubble in it burst, and many others too numerous to mention, could not have been possible were it not for the laxity the Curb shows toward the character of securities it lists and the latitude allowed to unscrupulous manipulators. These human vultures can use the Curb market as their field for preying upon a credulous public, and such piracy will not s top until the better element among the Curb brokers adopt firm measures for its complete reformation and regeneration. As far as the public is concerned it is too open. If the simple restriction were established that those who wish to list securities there must be of good standing and reputation themselves, it would go a long way toward checking the evil. Then such leading pirates of promotion as George Graham Rice, A. B. Benesch, B. X. Dawson, and many others, could no longer make use of the Curb to further their promotion operations. "